Place the tilapia fillets in a single layer in a shallow baking dish. Pour the tomatoes over and then sprinkle with the shallots. Drizzle the white wine evenly throughout the dish. Bake for 20 minutes, then stir. Return to the oven and bake for an additional 10 minutes. Stir again, and check for doneness. The tilapia should flake easily with a fork. If not, return it to the oven for an additional 5-10 minutes. 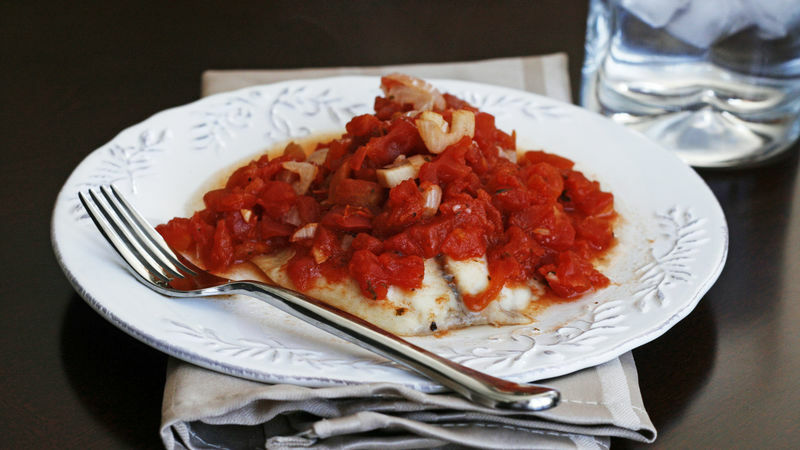 This recipe for Baked Tilapia with White Wine and Tomatoes is fast, easy and tastes amazing. Some fishes have strong flavors – salmon, for instance. As a result, people either love them or hate them. Other fishes, like tilapia, have a mild taste that is heavily influenced by the method it’s cooked with and the flavors that accompany it. Tilapia, if you’ve never had it before, is a delicate fish, which makes it great for baking or panfrying and not so great for, say, grilling. Be prepared with a wide spatula – a well-prepared tilapia dish will practically fall apart when you lift it, so you need it to be well supported when plating, and have that plate close by. Consider yourself warned. Tenderness aside, tilapia is great in so many preparations and this recipe for Baked Tilapia with White Wine and Tomatoes is no exception. The tilapia is baked in a 350 degree oven for 30-40 minutes, with sweet diced tomatoes, white wine and shallots. Yes, just four ingredients – but these four ingredients come together to create an amazing dish that will have guests begging you to share the recipe. There isn’t a better compliment than that. In my house, we adore fish – especially tilapia. We eat it several times a week, always different ways. How about you? Are you a fish lover or hater? Comment below!